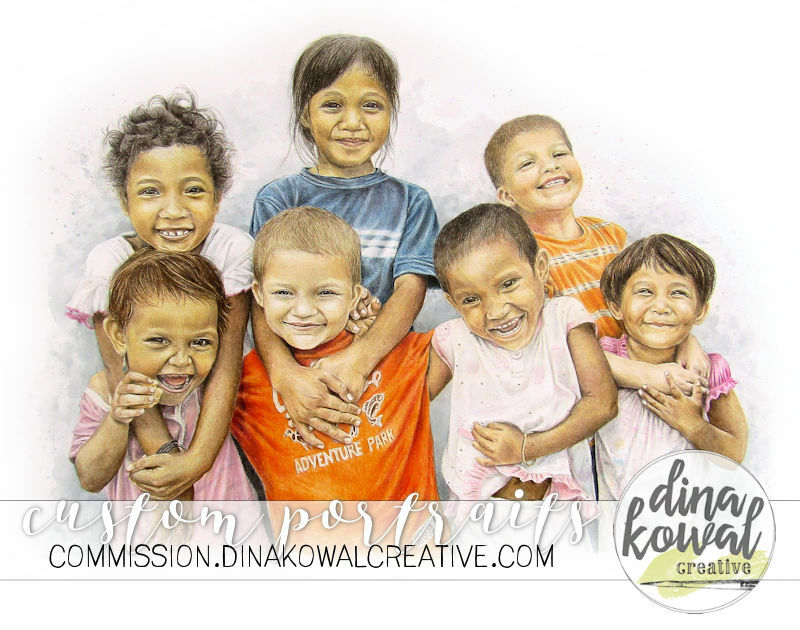 Dina Kowal Creative: Art show weekend! 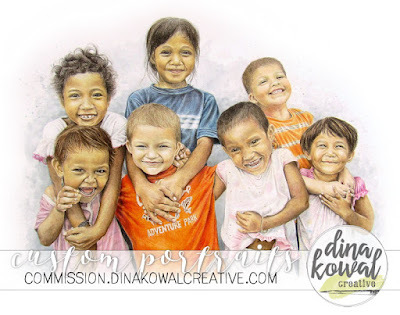 I loved the process of this piece, and recreating the expression of joy on each face! Many of you know that we were missionaries overseas for 9 years... the two boys in the picture are my "little boys" who are now 12 and 14. The girls are the children of some of our students. This was the largest piece I've done to date (18"x24"), and it was wonderful to be able to work on a larger scale with a higher level of detail. I'm excited to be able to add larger family portraits to my commission offerings as well! When I finished the first piece I had a little over a week until the show so I powered out one more... not sure I would recommend that pace, but I did finish and was able to enter it as well. 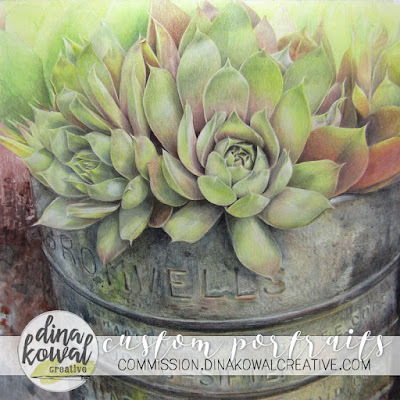 This piece is 16" square, done mostly in colored pencil, with the underpainting and added details done in watercolor. There were about 150 pieces total in the show, ranging from textile art to oil painting and all mediums in between. After the initial judging I was pleased to have 2 ribbons - one for artistic merit (honorable mention) on the succulent piece, and an artistic excellence ribbon on "Pure Joy". The final award of the weekend is the People's Choice award, which is by popular vote. It was a thrill to be the winner of that ribbon as well! Prints are available of both of these pieces in my store in your choice of size... I'm back to commissions this week with a secret memorial commission that I'll share in June. 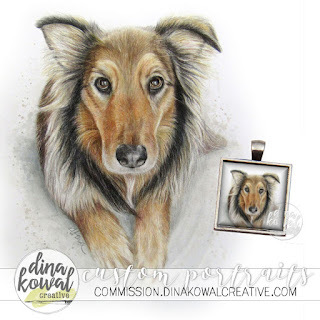 Below is my most recent commission, who's on her way to her mama in California with a custom glass pendant! You are simply flippin' amazing! I love your work. Ohhhh, to have that talent! 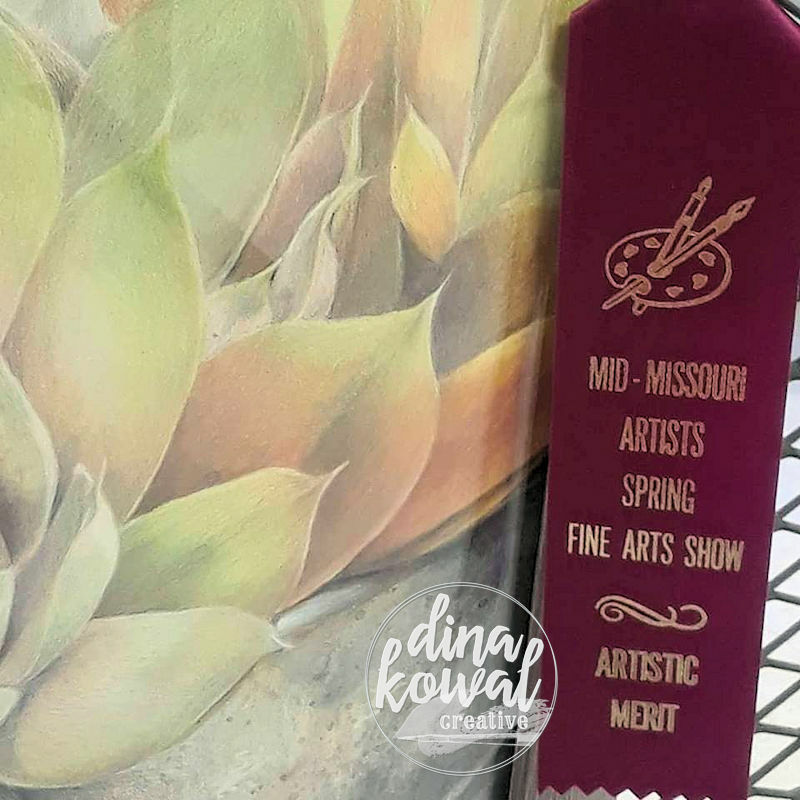 Well deserved ribbons, Dina. Absolutely stunning Dina. Congratulations. Well deserved. I love all the colors in the succulent and you really caught the personality of the kids in the other picture. And who wouldn't love the dog! Oh Dina! I love the Pure Joy - and it's no wonder it was the People's Choice. The giggles nearly leap off the canvas! And your boys - adorable! You clearly are doing what you are called to be doing. Just beautiful. Dina, I have your print of the succulents!! It arrived yesterday. It is even better in person. I am over the moon in love with it. Thank you!! These are all beautiful. I love the expressions on the faces. 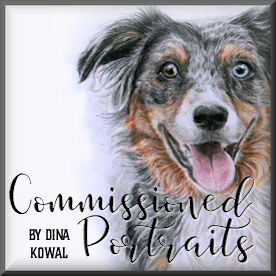 When I can get a good picture of my dog I will contact you. I want you to do me a picture of her. Love your work. Yay and congratulations on the ribbons and recognition! 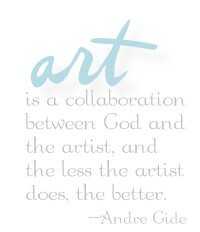 I hope you see that as motivational to do more pieces like that for shows! The delicate shading of the succulent is wonderful and who doesnt love happy childrens' faces? ?